Devon FYFC clubs played host to cyclists from Bradworthy YFC in June when the Club toured the County to raise money for Children’s Hospice South West. Bradworthy YFC’s Chairman Ryan Walter and Secretary Catherine Trible cycled 400 miles in four days to visit the 38 Devon clubs. 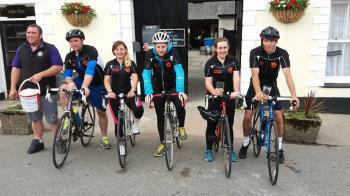 They were joined on the third day by Club members Mark Piddington, Craig Heale and Amy Osbourne. The challenge raised £3,000 for the Club’s chosen charity and meant they made new friends all across Devon! Yarcombe YFC, Winkleigh YFC and Kingsbridge YFC gave then a place to rest their weary heads over the three days and Cheriton & Tedburn YFC cheered them on when they reached the Devon FYFCs Rural Hub building on the third day.